A few weeks ago, I mentioned that Colby Mercer would be travelling to Melbourne to play for the Norwood Flames U12 Division 1 team in the Medibank National Junior Classics, the most prestigious junior basketball tournament in the country. They made a valiant effort playing multiple games against the best of the best from Victoria, NSW and the ACT, ultimately being ranked #12 in the country. Four Rostrevor players have been selected to represent the Torrens District in SAPSASA Soccer. Congratulation go to Aiden Schirripa, Nicholas Robinson, Cameron Tunno and Marco Cerracchio. 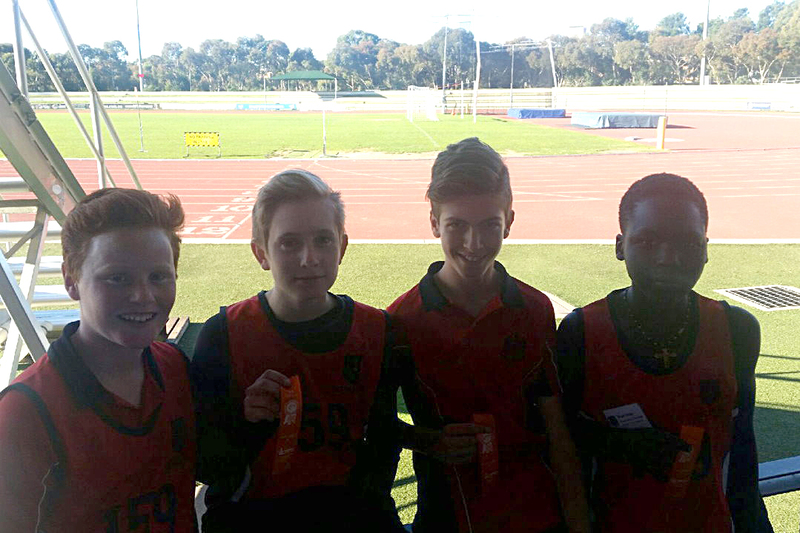 Rostrevor competed at the Catholic Primary Schools Athletic Competition at Santos Stadium last week. Aidan Schirripa competed in the Pentathlon and won first place, with four first places and a fourth! In the overall competition Rostrevor gained second place, only 6 points behind overall winners St Michael's College. The first Adelaide race of the UniSA Australian HPV Super Series was held at Victoria Park Racecourse last Sunday. 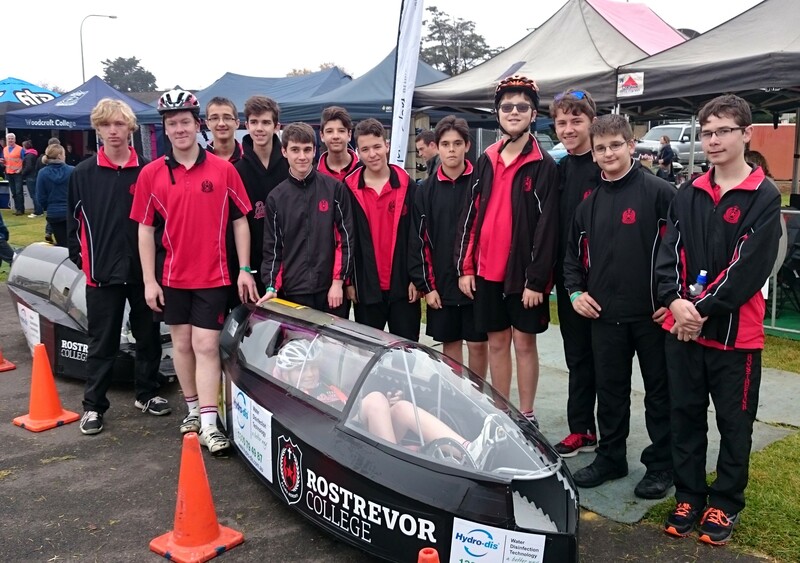 Rostrevor College entered Middle and Senior School teams. 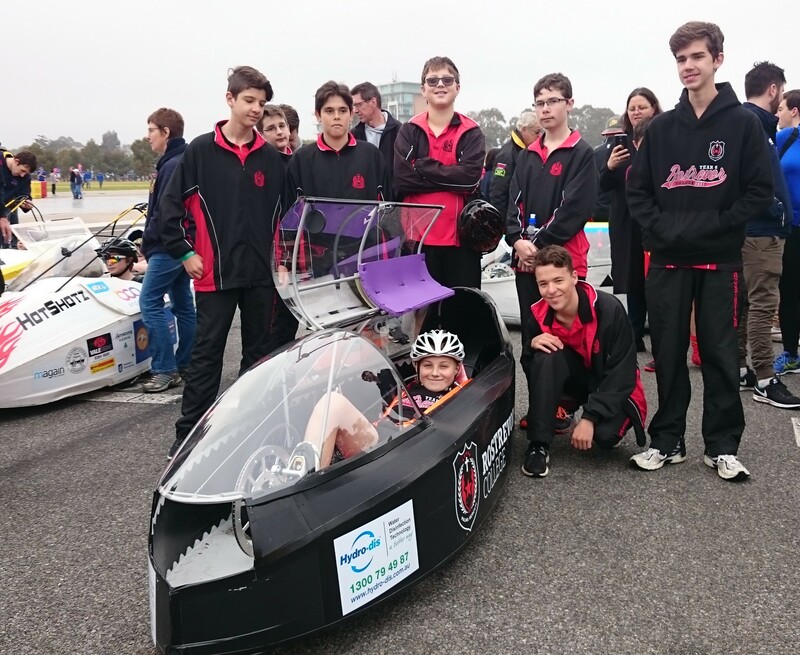 Last year saw a number of new students enter the Pedal Prix Teams and with ageing equipment a parent fundraising group was formed. Within twelve months the parent group lead by Michelle Byrne successfully raised the money to purchase a new Trump Race Trike for the Middle School team. The team gathered at 8:30am prior to the six hour endurance race with a mix of nerves and enthusiasm. Having only received and assembled the new vehicle two weeks before the race, students had minimal time to practice in the vehicle. Ciaran Byrne started for the Middle School team and his team mates circulated consistently all day, demonstrating fantastic teamwork and co-operation. Carter Smith was the first rider for the Senior team, beginning his fifth year of Pedal Prix at Rostrevor. Both teams stayed out of trouble for most of the day and avoided any major roll-overs or mechanical problems. Although the Middle School sustained some superficial damage to the bodywork early in the day, this didn't slow the team down dramatically. Both teams finished mid field and we saw considerable improvements with the Middle School team with their new vehicle. Congratulations on the team spirit to all team members. Jack Rudolph demonstrated a fantastic effort with a long period of consistently fast laps. Patrick Crowley helped out with the Senior team and also showed great development building on last year's form. Ryan Carey also needs thanking for his enthusiasm and consistency on the race track. Thank you to all the parents who helped out on the day, we couldn't do it without your help. 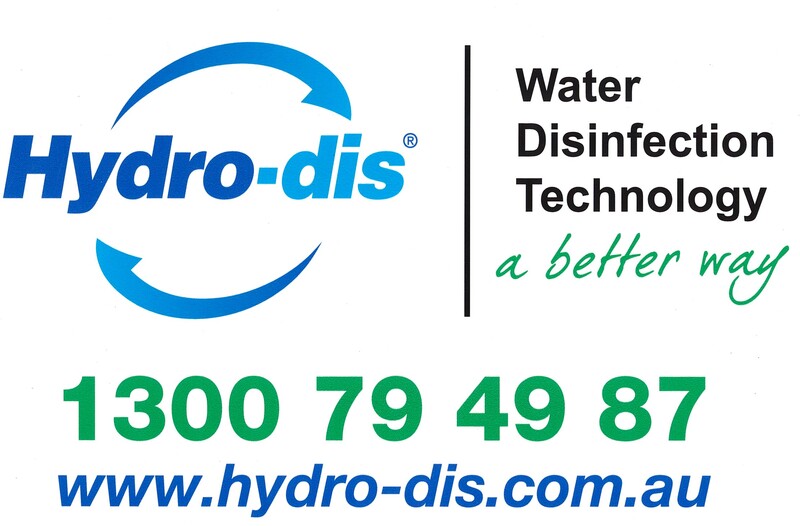 Special thanks to Mark Carey and his business Hydro-Dis for sponsoring our teams and to everyone who contributed to the fundraising to make the purchase of the new vehicle possible. Our next 6 hour race is on the 30th of July, we are looking for more Year 11 and 12 cyclists to participate. If you are keen to put in some time behind the pedals please see Mr Hunt or Mr Philips. The 3rd XI started slow, which was to be expected when only 9 players take the ground. After only a few minutes Pembroke had dominated and scored 2 goals against a struggling defensive Rostrevor line up. Although under manned and struggling against a Pembroke seconds team, Rostrevor held strong and kept an attacking Pembroke to 3-0 at the break. Just prior to the break a couple of 2nd XI players had made their way down to help out, and this was just the boost Rostrevor's tiring side needed. The boys begun the second half well and had the majority of the play in their attacking half, having numerous shots without any luck. When Pembroke did manage to push forward they were stopped in their tracks by in-form keeper James Cavallin - clear best on ground saving a large number of shots from the Pembroke side. After a struggling first 25 minutes, the Rostrevor side played extremely well against the Pembroke second team, being the better side for over 50 minutes. Well done to the boys on their efforts with a vast improvement compared to week 1's result against the same Pembroke team. Another fabulous effort from the prestigious 9A football team. Contested ball was a real focus all day against Sacred Heart and it was an arm wrestle for the entire game. When we switched play and the ball was on the outside, our class, skill and pace shone out and helped us to score goals. Our forwards looked dangerous for the whole game and were strong in the air and clever when the ball hit the ground. Our midfielders battled hard all day and never gave up on the contest. Our backline was very disciplined and kept Sacred Heart to a low score, which was a great effort considering some of the talent they had in their forward line. Sacred Heart made a strong comeback in the third quarter and Jake Slivak was positioned as a loose man in defence and played this role admirably helping to stem the tide. Christy Saji was a real enforcer with his attack on the ball in the backline. Tom Cusack collected plenty of the ball in the middle of the ground. During the last quarter, we got on top of the opposition and kicked a few goals in succession. Ned Carey was exceptional in this quarter with his pack marking and never taking his eye off the ball. It was a real team effort again and each of the 20 boys made their contribution on the day. Round 6 saw us at home against Immanuel in fine playing conditions. This was an important "Knock Out" cup fixture for both teams and there were concerns from past history that our boys tend to start a little slowly after a break. The first quarter was an even affair with both teams having moments of momentum. Both teams' defences were holding up well and the ball spent a lot of time being rebounded from end to end with minimal impact on the scoreboard. In the 2nd quarter we began to win more of the ball and started to dominate possession. Despite controlling the play we still continued to struggle to find an effective path to goal, often finding ourselves moving the ball too wide, or trying to execute a risky short pass in the attempt of trying to make something happen. Late in the 2nd quarter we relaxed a little and, against the run of play, Immanuel kicked 2 quick backto-back goals to take the lead by 1 point going into the main break. With a couple of positional moves made at half time and a re-focus on our ball movement and defensive action, our 3rd quarter was one of the best we have played this year. Our pressure on the opposition was terrific and we started to go more forward with the ball rather than just trying to keep possession. The last quarter we again took the pressure off the opposition allowing them to again kick a couple of quick back-to-back to back goals. However, we were able to re-group, get the game played back on our terms and finish the game strongly to record a good 49 point win. So far this season we have been inconsistent with our effort and execution. At times, we have struggled to find an effective forward and midfield chemistry to allow us to kick regular high scores. It was pleasing in this game to again see a good high score on the board. We just need to continue to work on our consistency for the full 4 quarters. It was great to see our captain Flynn Pisani return to form with some of his tackling and second efforts being a highlight. He set a great example for the others to follow. Cameron Ball continued his outstanding season. His ability to play and have an impact at both ends of the field has been really important for us. Ben Jarvis continues to improve and gain in confidence week by week, demonstrated by his ability to be some strong leads and 3 goals. Mitchell Gum also continued his strong season with another great game in defence. His ability to read the ball and cut off the opposition's movement has helped us form a strong back line. Murphy Short showed what he is capable of with an outstanding 2nd half. His attack on the ball and work rate provided the spark to get the boys rolling in the 3rd quarter. Congratulations to Tom McCormack & Jacob Scutella on their first 1st XVIII games for the College. Also, congratulations to Darcy Fogarty, Harrison Petty, Cameron Ball (U18), Luke Valente, Jacob Kennerley, Mihail Lochowiak (U17) and Joshua Shute, Cameron Taheny, Anzac Lochowiak and Thomas Tacono (U16) for their selection in the recent U18, U17 & U16 State Squads. These boys are certainly acquitting themselves well, demonstrating that despite being a smaller school, our program is providing a strong platform towards developing future careers. Whilst we acknowledge with these boys being out of our first XVIII side, it does leave a large hole and puts pressure on playing numbers for a few weeks. It has been pleasing to see the other boys embrace getting the opportunity and do really well coming in. This week we now move to a Thursday night fixture against PAC. This will be a tough game for us against an unbeaten team, but at our best we know we are capable, we just need to execute it for 4 quarters.